From the murky depths of an ancient lake, hidden deep within the maze of an Amazom rainforest, a slab of mud slowly makes its way towards the surface. It is a giant punch taken from the skin of the Earth holding twenty thousand years of history, extracted by a hollow, hundred foot syringe. And like a freshly-caught prize fish, it is placed on the floor of an open boat for safe keeping. The great cathedral of the Amazon forest, with buttressed colums and green stained-glwss, towers around the small lake. Research scientists stand about and stare at the lifeless form, wondering if hidden deep within its innards is the key that may unlock the answer to a mystery that has haunted them for years. Somewhere in the grey ooze may be a cache of pollen grains that unravels the mystery of a prehistoric Amazon... tell-tale traces of the forest that has come and gone before, like fingerprints that give away a crime. The Amazon past is one of the great unknowns of exploration. Researchers know how the forests of North America and Europe were built, even much about ice-age Africa and Asia. But the ice-age Amazon is, in the purest sense of the word, unexplored. In this unknown past lie the origins of the biodiversity of the richest ecosystem on Earth. Long prevalent was the view of an unchanging Amazon, where the past was like the present. Species gathered in the warm and humid environment avoiding the perils of freezing ice-age temperatures and the danger of extinction. This has been challenged by those who imagine an arid and decimated ice-age Amazon, with forests taking refuge in a few wet spots. Only after it warmed did the protected patches of plants and animals radiate back out. But new and fascinating research is uncovering evidence of cooling rather than drying, of a forest shattered by moderate cold with each passing ice-age. Pollen, mud and the disclosure of science will show how this green cathedral was built. The theories are extremely important in today's world because we are reading the past in order to look ahead to the future. By discovering how the green cathedral was built, perhaps we can predict whether the structure can be rebuilt after the great fire which is close upon it. The rainforest covering the vast Amazon River basin looks from the air like a uniform green carpet cut here and there by water. Actually, the forest is anything but uniform. 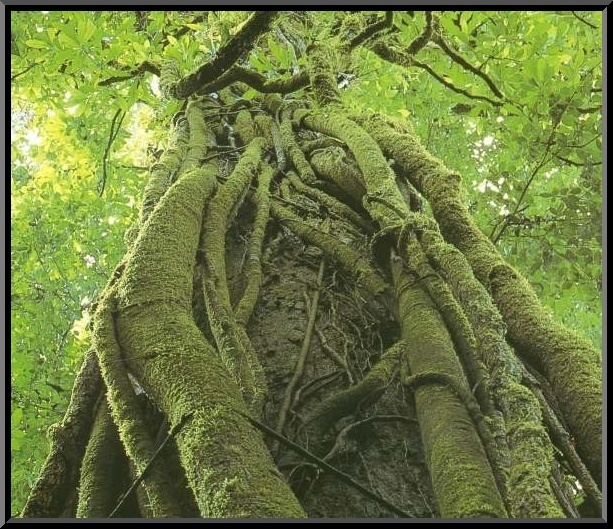 The "Carpet" is the forest's canopy formed by broad leaves of many different kinds of giant trees, and this canopy is but the topmost layer of an ecosystem supporting more species than any other region on Earth. The rainforest is home to perhaps 80,000 plant species and possibly 30 million animal species, most of them insects. The Amazon has often been described as an ancient ecosystem - a cradle of evolution. It has been conjectured that the stable climate of the region has allowed it to evolve slowly, producing the fantastic biodiversity present today. Current scientific work describes a much different ice-age Amazon. It was much cooler... a full thirteen degres F. colder than today. Environmentalists concerned with the possible dramitic effects of global warming speak of a five degree increase in temperature. The effects of a drop in temps almost three times that value would have overwhelming results. The immense biodiversity of the Amazon may consequently be a result of catastrophic events. Rather than a stable system, the Amazon may be in a continual process of rejuvenation and change. So, far from being disastrous to life in the Amazon, the moderate climate disturbances in the region may actually help account for the splendid diversity of the Amazon rainforest today. This is one controversial new answer to the mystery of the Amazon's history. At one time the Amazon River flowed westward, perhaps as part of a proto-Congo (Zaire) river system from the interior of present day Africa when the continents were joined as part of Gondwana. Fifteen million years ago, the Andes were formed by the collision of the South American plate with the Nazca plate. 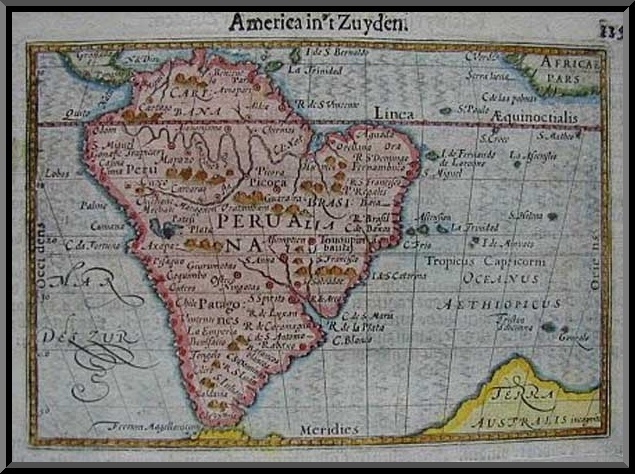 The rise of the Andes and the linkage of the Brazilian and Guyana bedrock shields, blocked the river and caused the Amazon to become a vast inland sea. Gradually, this inland sea became a massive swampy, freshwater lake and the marine life adapted to life in freshwater. For example: over 20 species of stingrays, most closely related to those found in the Pacific Ocean, can be found today in the freshwaters of the Amazon. About ten million years ago, waters worked through the sandstone to the west and the Amazon began to flow eastward. At this time, the Amazon was born. During the Ice Age, sea levels dropped and the Amazon Lake rapidly drained and became a river. Three million years later, the ocean level receded enough to expose the Central American isthmus and allowed mass migration of mammal species between the Americas. 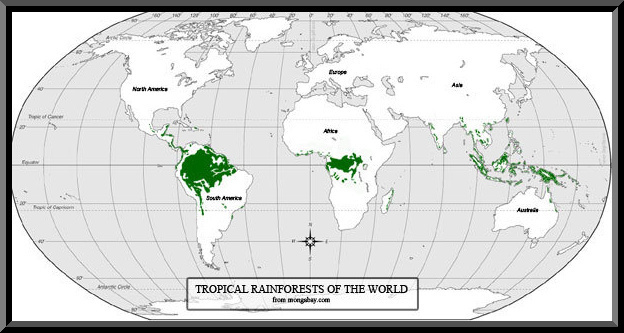 Tropical rainforests lie in the tropics between the Tropic of Capricorn and the Tropic of Cancer. In this regon, sunlight strikes Earth at roughly a 90-degree angle resulting in intense solar energy (solar energy diminishes as you move farther north or south). This intensity is due to the consistent day length on the equator: 12 hours a day, 365 days per year (regions away from the equator have days of varying length). This consistent light provides the essential energy necessary to power the rainforest by photosynthesis. Because of the ample solar energy, tropical rainforests are usually warm year round with temperatures from about 72-93F (22-34C), although forests at higher elevations, espically cloud forests, may be significantly cooler. The temperatures may fluctuate during the year but, in some equatorial forests, the average may vary as little as 0.5F (0.3C) throughout the year. Temperatures are generally moderated by cloud cover and high humidity levels. An important characteristic of rainforests is apparent in their name. Rainforests lie in the intertropical convergence zone where intense solar energy produces a convection zone of rising air that loses its moisture through frequent rainstorms. 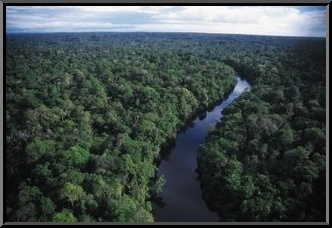 The rianforests are subject to heavy rainfall, at least 80 inches and in some areas over 430 inches of rain each year. In equatorial regions, rainfall may be year round without apparent wet or dry seasons, although many forests do have seasonal rains. Even in seasonal forests, the period between rains is usually not long enough for the leaf litter to dry out completely. During the parts of the year when less rains fall, the constant cloud cover is enough to keep the air moist and prevent plants from drying out. Some neotropical rainforests rarely go a month during the year without at least 6 inches of rain. The stable climate, with evenly spread rainfall and warmth, allows most rainforest trees to be evergreen, keeping their leaves all year and never dropping all their leaves in any one season. Forests futher from the equator, like those of Thailand, Sri Lanka, and Central America, where rainy seasons are more pronounced, can only be considered "semi-evergreen" since some species of trees may shed all of their leaves at the beginning of the dry season. Annual rainfall is spread evenly enough to allow heavy growth of broad-leafed evergreen trees, or at least semi-evergreen trees. The moisture of the rainforest from rainfall, constant cloud cover and transpiration, creates intense local humidity. Each canopy tree transpires some 200 gallons of water annually, translating to roughly 20,000 gallons of water transpired into the atmosphere for every acre of canopy trees. Large rainforests, and their humidity, contribute to the formation of rain clouds and generate as much as 75 percent of their own rain. The Amazon rainforest is responsible for creating as much as 50 percent of its own precipitation. Rainforests are characterized by a unique vegetative structure consisting of several vertical layers including the overstory, canopy, understory, shrub layer, and ground level. The canopy refers to the dense ceiling of leaves and tree branches formed by closely spaced trees. The upper canopy is 100 to 130 feet above the forest floor, penetrated by scattered emergent trees, 130 feet higher, that make up the level known as the overstory. Below the canopy ceiling are multiple leaf and branch levels known collectively as the understory. The lowest part of the understory, 5 to 20 feet above the floor is known as the shrub layer, made up of shrubby plants and tree saplings. The heavey vegatation of the canopy effectively screens light from the forest floor and in a true primary equatorial rainforest, there is little jungle-like ground growth to impede movement. Ground vegetation on primary forests is minimal and usually consists mainly of lianas (vines) and tree seedlings. An important characteristic of the canopy system is the presence of plants known as the epiphytes that grow on canopy trees. Epiphytes are not parasitic because they draw no nutrients away from the host, but use the host tree only for support. High in the canopy, epiphytes are better able to access the strong tropical light, which they require for growth. Epiphytes have adapted well to their aerial environment, developing various means to collect nutrients from their surroundings. An additional plant type characteristic of the canopy system is the liania... a sort of woody vine that begins life as a shrub on the forest floor and makes its way up to the canopy by latching on to canopy trees. A related plant type, the hemiepiphyte, begins life in the canopy and grows long roots that eventually reach the forest floor. Once rooted, hemiepiphytes do not have to rely on capturing nutrients from the canopy surroundings, but can access nutrients from the forest floor. Unknown numbers of plants and animals reside in the canopy, the vast majority of which are specifically adapted to life in this leafy world. In tropical rainforests, it is estimated that 90 percent of the species that exist in the ecosystem reside in the canopy. Since the tropical rainforests are estimated to hold 50 percent of the planet's species, the canopy of rainforests worldwide may hold 45 percent of life on Earth. Interdependence... whereby all species are to some extent, be dependent on one another, is a key characteristic of the rainforest ecosystem. Biological interdependency takes many forms in the forest, from species relying on other species for pollination and seed dispersial to predator-prey relationships, to symbotic relationships. These interdependent relationships have been developing for millions of years and form the basis for the ecosystem. Each species that disappears from the ecosystem may weaken the survival chances of another, while the loss of a keystone species... an organism that links many other species together, much like the keystone of an arch, could cause a sinnificant disruption in the functioning of the entire system. For example: Brazil nut trees (Bertholletia excelsa) are dependent on several animal species for their survival. These large canopy trees found in the Amazon rainforest, rely on the agouti, a ground dwelling rodent, for part of their life cycle. The agouti is the only animal with teeth strong enough to open their grapefruit-sized seed pods. While the agouti eats some of the Brazil nut's seeds, it also scatters the seeds across the forest by burying caches far away from the parent tree. These seeds then germinate and form the next generation of trees. For pollination, Brazil nut trees are dependent on Euglossine orchid bees. Without these large-bodied bees, Brazil nut reproduction is not possible. For this reason, there has been little success growing Brazil nut trees on plantations, they only appear to grow in primary rainforests. Life in the rainforests is competitive and countless species have developed complex symboic relationships with other species in order to survive. A symbotic relationship is a relationship where both participant species benefit mutually. Symbotic relationships appear to be the rule amd not the exception in the rainforest. Ants have symbotic relationships with countless rainforest species including plants, fungi and other insects. One symbotic relationship exists between ants and caterpillars. Certain caterpillar species produce sweet chemicals from "dew patches" on their backs, upon which a certain ant species will feed. In return, the ants protect the acterpillar and have even been observed carrying the caterpillar to the nest at night for safety. This relationship appears to be species specific in that only one caterpillar species will cater to a particular ant species. The Amazon has a long history of human settlement. Contary to popular belief, sizable and sedentary societies of great complexity existed in the Amazon rainforest. These societies produced pottery, cleared sections of rainforest for agriculture, and managed forests to optimize the distribution of useful species. The notion of a virgin Amazon is largely the result of the population crash following the arrival of the Europeans in the sixteenth century. Studies suggest that 11.8 percent of the Amazon's terra firme forests are anthropogenic in nature resulting from the careful management of biodiversity by indigenous people. 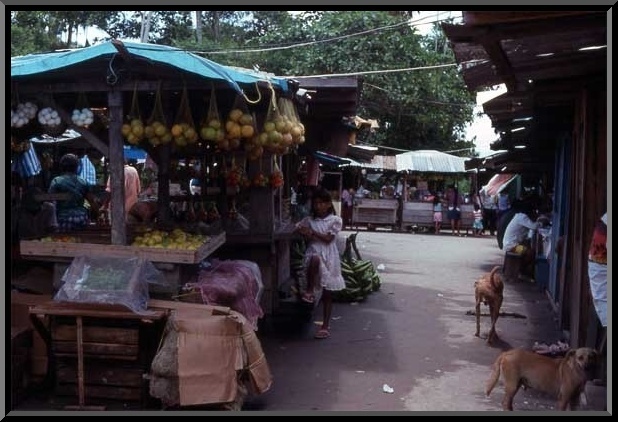 However, unlike those using current cultivation techniques, these Amazonians were attuned to the ecological realities of their environment from five millennia of ezperimentation, and they also understood how to sustainably manage the rainforest to suit their needs. They saw the importance of maintaining biodiversity through a mosaic of natural forests, open fields, and sections of forest managed so as to be dominated by species of special interest to humans.. Many of these populations existed along whitewater rivers where they had good means of transportation, excellent fishing, and fertile floodplain soils for agriculture. However, when the Europeans arrived, these were the first settlements to be affected, since the Europeans used the major rivers as highways to the interior. In the first century of European presence, the Amerindian population was reduced by 90 percent. 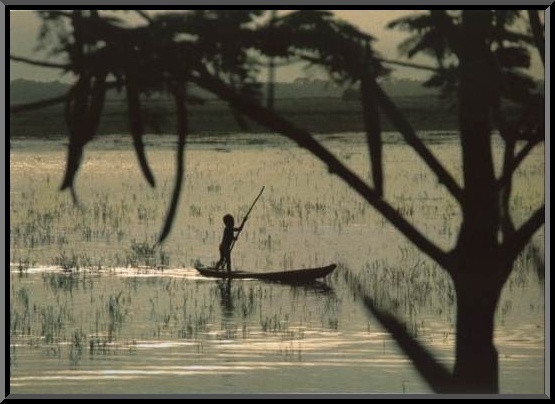 Most of the remaining peoples lived in the interior of the forest: either pushed there by the Europeans or traditionally living there in small groups. From Pizarro's conquest of the Incan empire, until the end of the Brazilian rubber boom around the beginning of World War I, the Spanish and Portuguse, in the name of Catholicism with the blessing of popes, continued the long tradition of abuse against these people... one that would be continued by colonists, rubber trappers and land developers. Today, despite the population decimation, natives still live in American rainforests, although virtually all have been affected by the outside world. 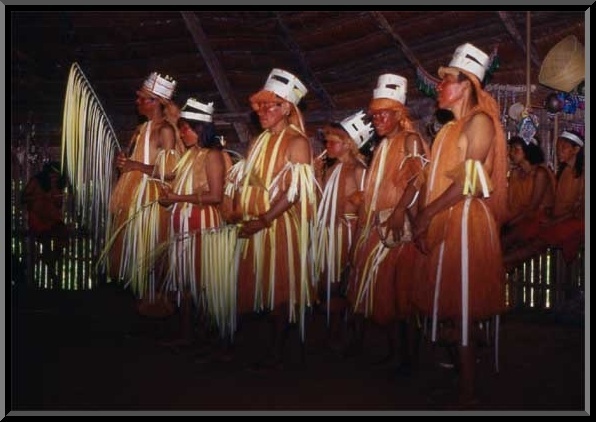 Instead of wearing traditional garb of loin cloths, most of the Amerindians wear western clothes and many use metal pots, pans and utensils for everyday life. Some groups make handicrafts to sell to the boatloads of tourists that pass through, while others make routine trips to the city to bring food and wares to market. Almost no native groups obtains the majority of its food by traditional hunting and gathering. Nearly all cultivate crops, with hunting, fishing and gathering, serving as a secondary or supplementary food source. Usually a family has two gardens... a small house garden with a variety of plants, and a larger one, which may be one hectare in area, planted with bananas, manioc or rice. These plantations are created through the traditional practice of slash and burn, a method of forest clearing that is not all that damaging to the forest if conducted in the traditional manner. 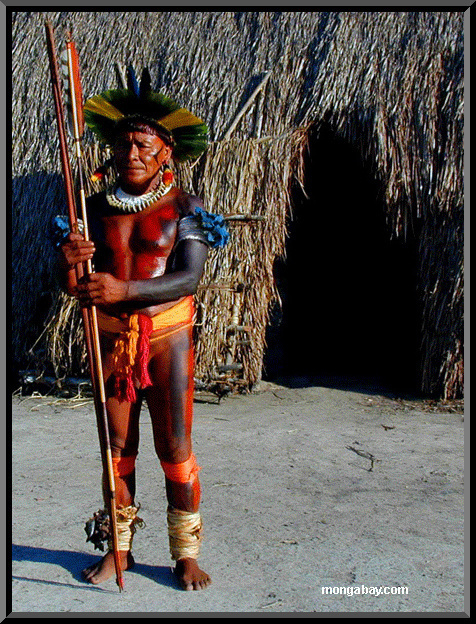 Today, almost no forest Amerindians live in their fully traditional ways. Perhaps only a few small groups in the Amazon Basin can still claim to do so. One of these, the Tageri (part of the Waorani group), is highly threatened by oil development in Ecuador. Its plight has become an international battle among environmentalists, human rights activists, the government, and the oil industry. Indian social mobilization of American indigenous peoples has attained the highest organization of any rainforest region. Forming ethnic organizations is one way to protect themselves, their culture and their natural resources. The Amerindians have faced a long, bitter battle against development of their land by outsiders, and today these organizations monitor these incursions on their lands. The Indian Missionary Council, CIMI, reported that land invasions of Brazilian Indian reservations by loggers and miners has risen since the mid-1990s. Loggers are increasingly trespassing on indigenous lands in search of Mahogany, which can no longer be leagally logged in Brazil. In the late 1990s and early 2000s, clashes between indigenous peoples and loggers, miners and oil developers received some exposure in the Western press, notably the on-going saga between the native Yanomani of Brazil and Venezuela and thousands of small-scale miners known as "Garimpeiros" in Brazil, who often illegally mine on the natives' demarcated lands. 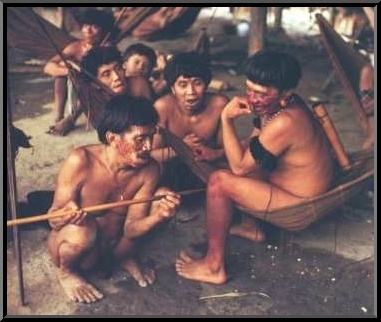 The far flung Yanomani Indian Tribe inhabits a France-sized area of forest in northern Brazil and southern Venezuela. The Yanomani lived in virtual isolation after they were first documented in the 1920s until the 1970s when large numbers of gold miners invaded their territory. The miners introduced diseases like measles, tuberculosis, the flu, and malaria to the resistant-deficient Tanomani, resulting in a serious decline in their population. Whereas an estimated 20,000 Yanomani lived in Brazil in the late 1970s, fewer than 9,000 existed in 1997. Violence between the Yanomani and armed Garimpeiros has also taken its toll resulting in a great many fatalities. The Garimpeiros disrupt the traditional yanomani way of life by using Mercury which pollutes local rivers, wildlife and the Yanomani themselves. The miners planes scare away the wildlife the Yanomani depend upon for food. The Garimpeiros have also brought guns to the Yanomani meaning that inter-village disputes today are more likely to end in shootings. Brazil has set aside large tracts of forest... roughly 12.5 percent of Brazil's total land area and 26.4 percent of the Amazon Basin for the indigenous population, which is made up of about 450,000 Indians, or 0.25 percent of the total population. These reserves, set forth under Brazil's 1988 constitution, has helped the country's Indian population to rebound after centuries of decline. According to "The Economist" [Feb. 2, 2006], 60 percent of Brazil's Indian population lives in the Amazon. These protected areas are not popular among poor farmers, landowners and developers, who have tried to fight the establihment of new parks and indigenous reserves and are known to illegally exploit resources, especially Mahogany and other valuable timber within the boundaries of protected areas. A 2006 study conducted by researchers at the Woods Hole Research Center and the Instituto de Pesquisa Ambiental de Amazonia, found that parks and indigenous reserves in the Amazon help slow deforestation. Using quantitative analysis of satellite data, the research concluded that deforestation, and the incidence of fires was significantly lower inside the perimeter of reserves and demarcated indigenous lands. 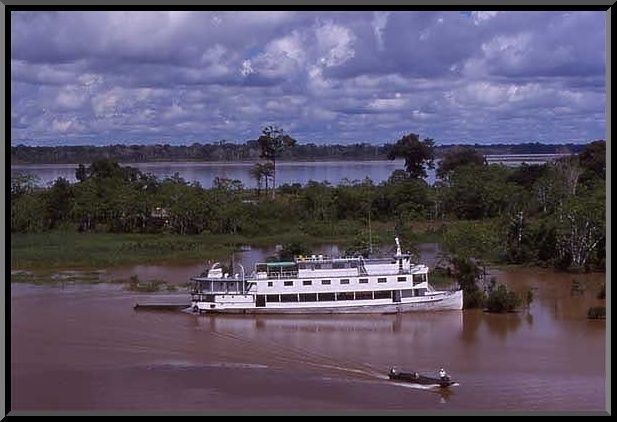 Today, the Amazon River is the most volumimous river on Earth, aleven times the volume of the Mississippi and drains an area equivalent in size to the United States. During the high water season, the river's mouth may be 300 miles wide and every day up to 500 billion cubic feet of water (5,787,037 cubic feet/sec) flows into the Atlantic. For reference, the Amazon's daily freshwater discharge into the Atlantic is enough to supply New York City's freshwater needs for 9 years! The force of the current, from sheer water volume alone, causes the Amazon River water to continue flowing 125 miles out to sea before mixing with Atlantic salt water. 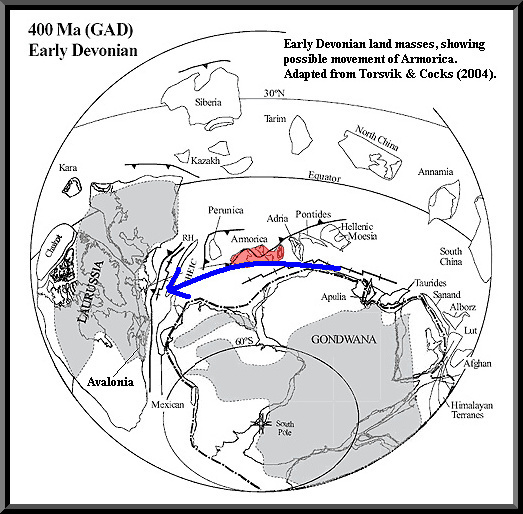 Early sailors could drink freshwater out of the ocean before sighting the South American continent. 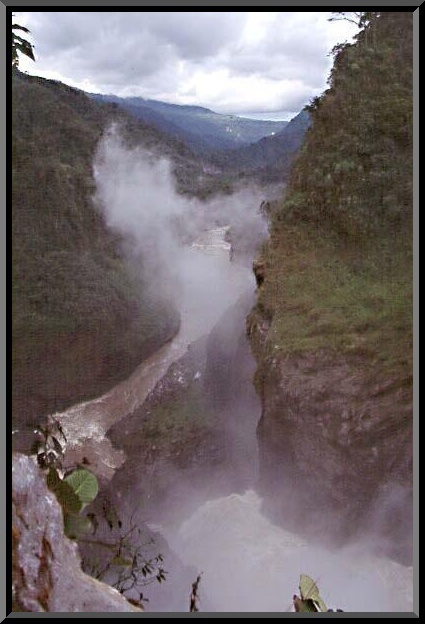 The river current carries tons of suspended sediment all the way from the Andes and gives the river its characteristic muddy whitewater appearance. It is calculated that 106 million cubic feet of suspended sediment are swept into the ocean each day. The result from the silt deposited at the mouth of the Amazon is Majaro Island, a river island the size of Switzerland.